The recipe of Momos is from Tibet.This is regional food of Tibetans and they like to eat Momos in morning breakfast because of its benefits.This food prepared with green veggies and also with less spices. Momos nowadays available in every restaurant menus in every city. Momos served with spicy chutney which is also we prepare at home. The use of oil is very rare in making Tibetan steamed dumplings, and this food is cooked in steam. In addition to the beggars, chicken and cheese stuffing is also done in Momos. Tandoori Momos is also very popular with steamed momos but now we learn that how to make Vegetable Momos at Home with simple and easy method.Let's checkout recipe first. Step 1 : Wash all the veggies in plain water and finely cut them carrot, cabbage, capsicum ,french beans. Step 2 : Add 2 cups of flour (maida),salt and teaspoon oil in large bowl and Make a soft dough and prepare it. Cover the dough and keep aside for 1 hour, so that the dough should be set. Step 3 : Heat 1 tablespoon oil in pan and add ginger, green chilli in hot oil and fry a minutes. Step 4 : Add chopped vegetables, tofu or cheese. Mix black pepper powder, red chilly as required, a teaspoon vinegar, 1 teaspoon soya sauce, salt and green coriander and fry them for 2 minutes . Step 5 : Filling mixture is ready to fill in Momos.If you are using onion and garlic in it, then first roast the onion and garlic before cooking it, then add the vegetable and fry it. Step 6 : Again knead the dough for 2 minutes and divided into equal portion. cut each into 9-10 equal portions.Make round balls of every small portion and pressing it with your palm make like chapati.cover with plate for preventing drying. Step 7 : Make small chapaties from all ball and make center of chapati thicker as compared to sides of chapati. Step 8 : When Its done then filling 1 teaspoon of mixture in center of chapati.Don't over filling because it will be difficult to get a proper Momos shape. Step 9 : Lift the edge from one side and start pleating fold the edge little inside and little outside alternatively.Join them in center and seal it.Prepare all the momos like that . Step 10 : Now Momos has to cook in steam. For this, you will have to take a steamer and grease it with oil with the help of clean cloth for preventing sticking. Step 11 : Arrange all the momos on steamer plate and keep some space around them to expand.Heat 1-2 cup water in steamer over medium flame. Step 12 : When water is hot then place stand in steamer and place plate on over it. 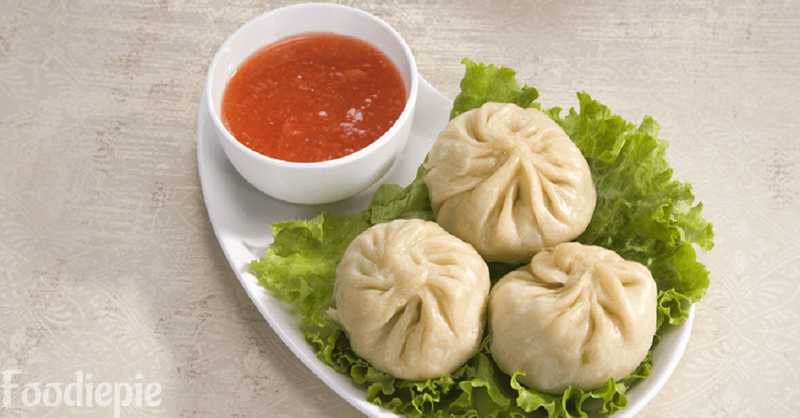 Momos should not touch with water keep distance water between moms.Cover it with lid and steam them for 7/8 minutes over medium flame.Remove the lid and check the condition of momos cook until momos look shiny.Check with hand touch them if feel non sticky then it means they prepared. Finally : Crunchy Veg Momos in ready transfer them to plate and serve with spicy hot chutney.